WASHINGTON, D.C. (February 6, 2019) – Last night Iraq and Afghanistan Veterans of America (IAVA) incoming CEO Jeremy Butler was a guest at the State of the Union. Butler prepared a video statement on Facebook yesterday afternoon, giving voice to the expectations of the Post-9/11 generation of veterans. Just before he entered the Capitol for the President’s speech and the Democratic response, Butler shared a live video statement about what veterans wanted to hear. After the State of the Union and the response, Butler again shared his views publicly about what he heard in another live video statement. IAVA was disappointed, and so were many veterans who were tracking the State of the Union and commenting on Twitter during the event. The President provided a moment of inspiration when he honored three World War II veterans: Staff Sergeant Irving Locker, Private First Class Joseph Reilly, and Sergeant Herman Zeitchik. With so much focus on these three veterans throughout the night, other veterans expected to hear substantive policies regarding the issues they care about: taking care of veterans. President Trump had one sentence on veteran policy, and it referenced the Veterans Affairs Accountability and Whistleblower Protection Act, passed in 2017. IAVA supported this legislation – it was an important step forward. But there was no mention of the most pressing legislative reform the Department of Veterans Affairs is currently implementing, the MISSION Act, passed into law last year. Other than one brief mention, neither the State of the Union nor the Democratic Response addressed veterans issues. On the conflicts in Iraq and Afghanistan, Butler penned an Op-Ed featured on CNN’s opinion page last night. Veterans of those conflicts want to know their sacrifices were worth it. 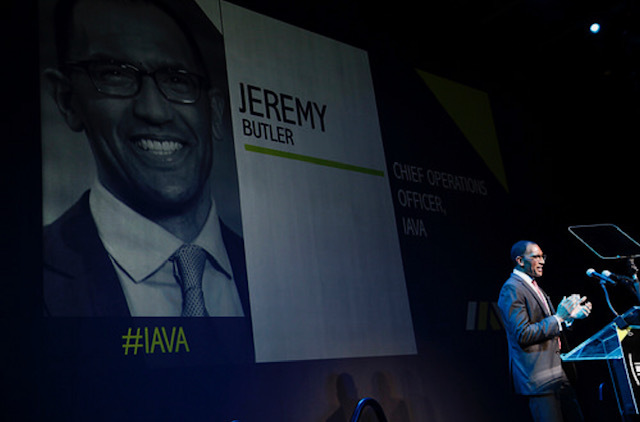 Butler is giving voice to IAVA’s 425,000 members, the 3 million men and women who have deployed overseas to the conflicts in the Middle East and Afghanistan, and the entire generation of post-9/11 veterans. 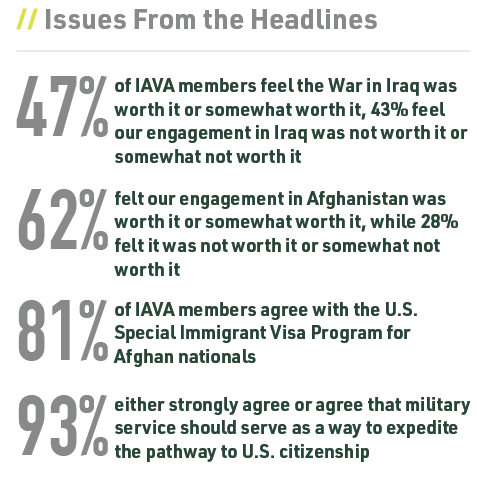 IAVA surveys its membership annually about a range of issues, including veterans issues and the conflicts in Iraq and Afghanistan, and also topics such as guns, immigration, cannabis, and President Trump’s proposed military parade. The 2018 results were released last week and are available here. Combat suicide among troops and veterans. Recognize and improve services for women veterans. Defend veteran and military education benefits. Defend and reform government support for today’s veterans. Support for injuries from burn pits and other toxic exposures. Empower veterans who want to utilize cannabis. The President and Democratic leadership are not prioritizing veterans issues. Incoming CEO Jeremy Butler last night called upon IAVA members and post-9/11 veterans to make sure their voices are heard in Washington. IAVA will be Storming the Hill from March 4 – March 8 to take veterans concerns to leadership in Washington. Join the movement by signing up for Storm the Hill on the IAVA website.